In addition to the standard components of the Mega Torq, several optional components are available to provide the extra strength necessary to handle extra high horsepower and torque loads. FOR APPLICATIONS OF 950 H.P. TO 1250 H.P. When torque and horsepower exceed 900, in heavy cars or trucks or when using a transbrake in these applications, the billet shaft and special billet steel input hub is required. The entire torque of your engine is being transmitted into the transmission through the shaft and through the drive hub into the forward clutch pack, which in turn, transmits this force to entire driveline. 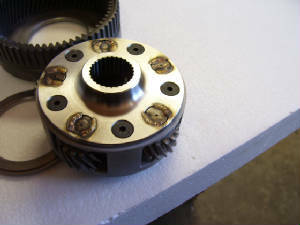 The stock input shaft transfers this power via 28 splines into a cast metal drive hub. This system has proven fairly reliable up to 800 h.p. in an average size racecar, but more severe conditions will result in sheered splines, fracturing the hub and even twisted and broken input shafts, often destroying the transmission. To resolve this weakness in the transmission, we will install these billet components. THE INPUT SHAFT is machined from 300 Maraging AMS 6514 alloy, precision ground on all critical diameters and then Heat Treated, providing dynamic torsional strength. THE INPUT HUB is machined from solid 4140 HTSR steel and Nitride Heat Treated for maximum durability. THE SHAFT TO HUB SPLINES have been increased from 28 to 35 Splines providing a 25% increase in surface contact area. For the same applications as the Billet Input shaft/hub above, the forward clutch drum holds the steels between the forward clutches and when these clutches are engaged, forms the other input component that transfers the input torque to the driveline. 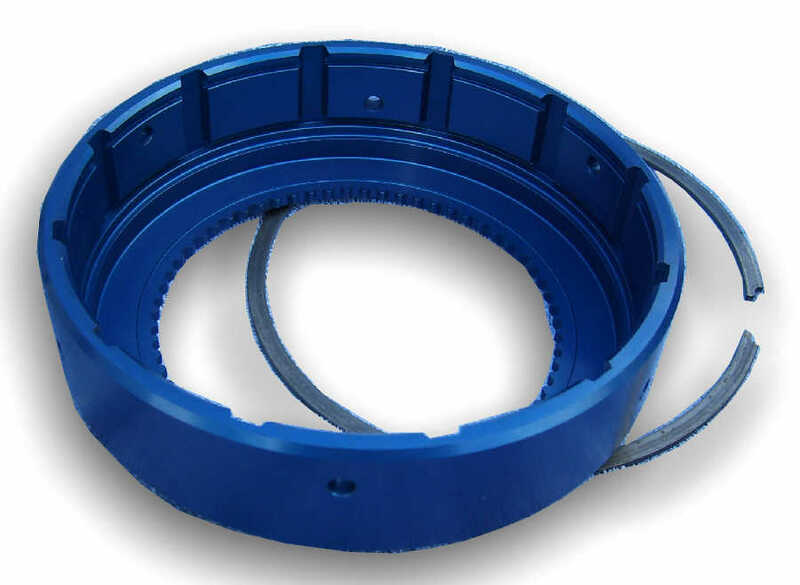 In stock form this drum is a cast metal component that must provide the clamping force as well as driving the torque to the drive planetary ring gear through its cast metal teeth. This drum also provides reliable and adequate service in most racecars up to 850 h.p. However under severe conditions this casting may fracture loosing clutch apply, input clutch drive and possible transmission explosion. To overcome this week link, in high power applications, we will replace the OEM casting with the Billet Aluminum forward drum. Precision machined from 7075-T6 BILLET ALUMINUM, this drum provides the strength necessary to eliminate the potential problems associated with the cast drum. PERFORMANCE BONUS: This Aluminum drum is approx. 57% lighter than the stock unit resulting in a direct reduction in inertia mass weight. FOR APPLICATIONS WITH 1251 TO 1450 H.P. This hardened output shaft is a must for applications producing 1200 and up horsepower utilizing a transbrake or in a heavy vehicle. Made from 4340 - 300 Maraging alloy steel, this 300M Hardened Output Shaft, is 4 times stronger than the stock output shaft. FOR SPECIFIC APPLICATIONS and EVEN HIGHER H.P. For very special applications and extra heavy, very high horsepower applications, straight cut gears may be desired. A major benefit of using straight cut gears is the ability to utilize five forward clutches as opposed to the 4 clutch arrangement. This is occomodated as a result of the longer splines of the straight cut. 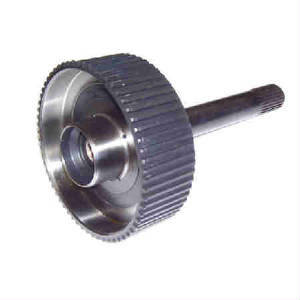 The gears and annuluses are made from 8620 gear steel, some of the carriers are made from 7075 T-6 billet aluminum, 4340 steel or investment cast steel. These sets are currently available in ratios of 2.45/1.45/1:1, 2.28/1.45/1:1 and 2.77/1.57/1:1. Call for information on availability and pricing on these very specialized gear sets. LET US HELP YOU DETERMINE WHICH IF ANY, OPTIONAL COMPONENTS THAT YOU REQUIRE IN YOUR MEGA TORQ TRANSMISSIONS!